Take six nesting and sorting blocks, add six numbered animals to go inside, and what do you have? A farm full of stacking, counting, hide-and-seek, mix-and-match, imaginative play! Melissa & Doug Nesting & Sorting Barns & Animals charming play set lets kids build a farm scene filled with bright red barns, with an animal for every barn. On their front panels, the barns feature doors sized to fit their animal occupants; on the back, a full-color scene showing the animal in an outdoor setting. Kids can also pair numbers on the barns and animals to put together the correct pairs, reinforcing early-learning concepts as they play. Suitable for ages 2 years old and up. Ask the child to line up the barns from biggest to smallest. Then point to the numerals on the barns as you count to six together. Help the child place the animals in numerical order. Then ask the child to put each animal in the numbered barn that matches. 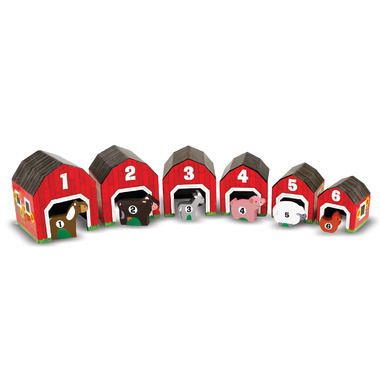 With the illustrated backs of the barns facing out, place the matching animal next to each barn to show the corresponding numeral. Count the farm animals in the illustration to demonstrate the quantity, and point to the wooden animal to demonstrate the numeral. Then look for birds or insects that represent the same quantity. Place the wooden animals in a line for the child to study. Then, while the child looks away, hide one of the animals inside a barn. Ask the child to tell you who is in the barn by looking at the remaining animals. Then allow the child to lift the barn away for the big reveal! Ask the child to match each wooden animal to the appropriate illustrated scene. Challenge the child to compare the wooden animal to the illustrated animals to look for similarities and differences. Line up the animals on the play surface, and point to each one as you name its color. Then name a color and ask the child to point to all the animals that have that color on their bodies. Define a group by naming a physical characteristic (such as spots or floppy ears), then ask the child to gather together all the animals that belong in the group. Add to the challenge by including the illustrated options in the search. Challenge the child to stack two or more of the animals. Talk with the child about which animals are best for stacking, and why. Experiment with different ways to stack the pieces (on their backs, on their sides, and so on). Use the barns to create a farm scene. You can create groupings where some animals live close to each other, spread the barns far apart to represent separate farms, or alternate the barns (some facing forward, some facing backward) to create pastures and fields between the buildings. Add other play pieces to the scene if you wish, and get creative!